The question of history is among the most important, but also the most complex, in the philosophy of Eric Voegelin. I am not certain that he ever formulated a united and definitive theory on this question. Since the 1930s, Voegelin had been recognized as a scholar in the history of ideas. His two volumes on the idea of race published in 1933 retrace the genealogy of a biologico-political symbol; his work on The Authoritarian State of 1934 relates to an historical sociology applied to juridico-political ideas; the Political Religions of 1938, finally, represents a first attempt to apprehend the history of the modern west in its unity. It remains that the theoretical question of the conditions of the possibility of history and historiography, was only asked later, during the 1940s and the 1950s. At that time, Voegelin was struggling to write a textbook on the history of political ideas, and faced problems relating to order and method. Moreover, the richness of the material that he discovered at this time made it impossible to write a unilinear history aligned with the political history of the west. The same period sees the birth of new attempts at writing history, such as those undertaken by Karl Löwith (Meaning in History, first published in 1949) or Karl Jaspers (Origin and Goal of History, also published in 1949), not to forget the monumental oeuvre of Arnold Toynbee (A Study of History, whose volumes were for the most part delivered between 1934 and 1954). These three works, of widely differing length and ambition, share the common feature of offering an alternative to the standard schema, inherited from the Enlightenment, of a unilinear universal history, oriented towards a final historical state and structured by the category of progress. For the three authors, our era is located at the end of a declining age, at a moment of crisis. For all three, the intelligibility of history also does not imply the idea of an overall meaning of history. Voegelin had himself always attacked the modern category of progress, which he saw as a product of modern ideology. Even when he wrote “histories of ideas” without theorizing the actual meaning of this term, the schema he uses for interpreting modern history is a schema of decline. In 1933, the modern idea of race is perceived by him as a “counter-idea” and “an image of destruction.” The works of 1934 on authoritarianism and totalitarianism and of 1938 on political religions constitute a critique of contemporary collectivist political models, and, indirectly, of the modernity that made these regimes possible. Later, Voegelin would challenge the very idea of a meaning of history. He would use the less connotative term configurations of history – implying that history itself does not possess an immanent meaning, but is itself configured by an experience of the human conscience. The alternative schemata suggested by Löwith, Jaspers or Toynbee, who were themselves the heirs to other thinkers such as Burkhardt or Spengler, could not, in this respect, but arouse his interest. While engaging in dialogue with these contemporary authors, Voegelin was however unable to find himself in their ideas. He criticized Jaspers for having made the “Axial Age”, or the founding spiritual outbursts of the great civilisations, a localized event within an arbitrarily defined historical period (since it excludes Christ, Mani and Muhammad). Even more than to this arbitrariness, Voegelin was opposed to making these spiritual outbursts events within history and produced by it. Conversely, it should rather be said that these events lead to the foundation of an historical conscience and that, without them there would be no possibility of a history with global meaning. He reproved Toynbee, broadly speaking, for the same reason ‒ for historicizing spiritual theophanies instead of viewing them as the very condition of historicity: history, he writes, is not a simple “morphology of civilisations.” The model of the parallelism between the civilizational cycles remains excessively external to the historical process, as long as it does not go back from the analogy of the symbols to the unity of the consciousness that produced them through an act of transcendence. As for Löwith, Voegelin praised him for having understood that there is a meaning in history and not a meaning of history, but he did not subscribe to his original dualism between Greek thought and Judeo-Christian thought. Close to, but nevertheless dissatisfied with, the contemporary schemata, Voegelin takes his models further. Plato and Augustine are only rarely considered as “philosophers of history.” According to Voegelin, they nevertheless furnish the most appropriate models for a theory of the historicity of consciousness. And not only due to the fact that they both experienced “leaps in being” – to which case we ought to add Moses, original founder of a “history” – but because they produced at a speculative level a philosophical theory of the conditions and foundations of history. Let us begin with Plato. Voegelin’s study is closely related in this instance to the interpretation of the mythopoetic narratives of the dialogues, which he undertook in his Plato and Aristotle of 1957. Voegelin was interested not only in the “poleogonies” of the Republic and the Laws, but also in the narratives of the Timaeus and Critias, as well as in certain eschatological narratives, such as the myth of Er at the end of the Gorgias, which he interprets through an historiographical prism, as the transfer of the authority of Athens from the traditional rulers to the philosopher, whose soul is righteously ordered towards God. The myth is not only for Voegelin the expression of the compactness of the archaic symbols; it is also the adequate expression of a history whose foundations are located in the unconscious, that is to say, in the pre-logical experience of the soul of its relationship to the divine. Plato is the witness of a revolution. Platonic philosophy completes the movement initiated by the Presocratics rejecting the old cosmological myth. Society is no longer, in its view, an analogue of the cosmos, but primarily an analogue of the human psyche addressed and measured by God: it is not a microcosmos, but a macroanthropos. The model of the order of the good society is located in the order of the soul of the philosopher, who responds to the address of the divine by ordering all the powers of its soul in accordance with his vision. As a result, society is no longer the mediator between the individual and the divinity, but the freely consented community of persons open to the same transcendent content and in agreement about a truth located beyond the world. Relative to this essential discovery, there is a before and an after, providing structure to a historical order, so that we may speak, although of course in a non-relativistic sense, of a “historicity of truth”. The cosmological society structured by its myths is consigned to the archaic past, permanently superseded by the articulated logos of philosophy. This movement is irreversible. The experience of transcendence thus confers meaning on history, which is that of the passage from compactness to differentiation. History, writes Voegelin, is the process of revelation of the divinity, a process in which mankind articulates its own nature in partnership with God. This history also acquires a universal dimension, since it is not the Greek or the Jew whom God addresses, but indeed man as such. It is one thing to say that a people is the messenger of the new truth and that it has accordingly been led to assume the leadership of the new Hellenic federation – according to the model proposed by Plato; it is another thing to say that history is that of a people or of a polis – and Voegelin sees Plato’s attachment to the model of the polis as a leftover that is incompatible with the movement initiated by his thought. History therefore bursts forth into the experience of transcendence as a history of humanity. Voegelin often refers to this schema, especially in the first volumes of Order and History, published at the end of the 1950s. He nevertheless refines it in his writings of the 1960s and the 1970s. This initial schema, actually, does not take sufficient account of what is produced after the leap in being constituted by Platonic philosophy. The vision of transcendence articulated by the philosopher introduces a dimension of irreversibility into history: something cannot be restarted once it has been completed. It also introduces a dimension of impassability. It is interesting to note than Plotinus had confronted the same question. According to Plotinus, Plato gave the most articulate expression possible of the relationship of transcendence to the world. The philosophers before him gave of it only partial and compact statements. But what happens after Plato? For Plotinus, a new force intervenes which he designates tolma, boldness, the desire to create something new by going beyond the vision of truth. Aristotle, according to Plotinus, began this process of destruction, whose culmination is represented by the Stoics and the Gnostics. What is the place of Plotinus himself, we might ask, within this post-Platonic history? That of a restorer of the Platonic philosophy against the Gnostic disorder? The articulation of the symbols is intended to be followed by something that Voegelin interprets using other categories than those of compactness and differentiation, namely those of revolt and restoration. History is thereby split into two: a pre-Platonic history which is that of the articulation of the symbols of transcendence, and which follows a linear schema up to that point; and a post-Platonic history of crises and resistance to them – a history that is no longer linear, but which rather takes a cyclical form, as do the main myths of Plato. This second schema tends to cover the first. There is at least a chronological reason for this: the first “rebels” against the order of the soul and the society are, for Voegelin, not Aristotle and Theophrastus, but in fact the Sophists, and the Sophists come before Plato – in the same way that Gnosticism comes not after, but before Christianity. Plato is therefore not only the one who broke with the compactness of the ancient myths; it is also he who enlists philosophy in a struggle against the disorder caused by the Sophistic revolt. Plato thus waged war on two distinct fronts; for the Sophistic revolt does not represent a return to the naivety of compactness. It is rather the product of an autonomization of the logos, similar to what Vico would call the “barbarism of reflection”. Plato is also, for Voegelin, in the same position as Plotinus, which is that of a restorer of the proper use of logos against its sophistic usage. And Voegelin would describe himself as being in the “the Platonic position” of also being forced in his age to restore the truth of order against the disorder engendered by the autonomized rationality of the Enlightenment and positivism. The line separating the compact and articulated symbols, which was so significant in the first three volumes of Order and History, tends subsequently to blur in favour of a demarcation line between philosophy and its deformation as philodoxy. In this battle, myth is not the enemy of the philosophical logos, but rather its ally. Philosophy defines itself as an act of resistance against disorder before being an act superseding the compactness of myth. “A study of order”, writes Voegelin in the preface to The World of the Polis, “does not have the purpose of showing up the primitivity, naïveté, logical deficiency, or general benightedness of ages of the past but, on the contrary, to show men of the same nature as ours, wrestling with the same problems as ours, under the conditions of more compact experiences of reality and correspondingly less differentiated instruments of symbolization.” Voegelin would continue to emphasize during the 1960s, and especially in his 1970 article cited earlier on the equivalences between symbols, the fact that compact and differentiated symbols are responses, at different levels of articulation, to an identical experience, and are, from this perspective, “equivalents.” Voegelin claims that this idea of equivalence has been taken from Aristotle, who wrote that philosophy has merely stated, with regards to the question of the foundation, in another form what the ancient myths have already expressed. The philosophos, says Voegelin commenting on Aristotle, is a philomythos: the lover of wisdom and the lover of myth thus stand united, against the philodoxos, the lover of doxai. This leads Voegelin to a reinterpretation of the cyclic schema. Initially (perhaps following the example of Karl Löwith), Voegelin subscribed to the idea that cosmological societies visualize the cosmic order as an eternal cycle, preventing any form of historicity. He writes accordingly, in Israel and Revelation, that “without Israel there would be no history, but an eternal recurrence of societies in cosmological form.” This contrast nevertheless tended to become blurred in the writings of the 1960s and 1970s. In The Ecumenic Age, he writes that the idea of cosmic cycles assuming the pattern of an “eternal return” was a later, post-Platonic creation, introduced by Aristotle in his Problemata, and based on a hypostasis of the cosmos as an object of logical speculation. For the ancient imperial societies, their experience of the cosmos was that of an unstable order, into which the fragile existence of mankind would be inserted. This experience of anxiety is preserved in the Platonic myths. The cyclical schema is not a dogma designed to answer the question of the meaning of history, but a projection into time of the anthropological principle, according to which society is made in the image of the human soul, fighting “a sequence of struggles and victories” on behalf of order. The cycle signifies nothing else here than the ever-ephemeral character of an order condemned to be dissolved and to be restored through the action of the philosopher king. Platonic history is no longer articulated here as a before and an after the “leap in being” achieved once and for all by philosophy. The schema proposed by Voegelin in his writings of the period 1960-70 is slightly different. The experience of participation in a transcendent order of being is divided, so to speak, into the consciousness of a beginning and a beyond. For Voegelin, no more than for Augustine interpreting the first verse of Genesis, the beginning is not a temporal category; it refers back to the foundation of existence, to the apeiron found at the origin of everything. As for the beyond, it constitutes the telos that is out of reach but which nevertheless provides a structure for all human acts. For Plato, thus, history is primarily that of the confrontation of the order of truth and the order of the pragmatic polis. The order of the Republic is the model of the order of the soul for the philosopher, who seeks to embody it, as far as possible, within the polis. This order is not, however, destined to last indefinitely once it has been implemented. It will succumb to decline, and require restoration, of an ineluctably ephemeral nature, through the action of the ruler-philosopher, an action relying on persuasion (Peitho), but also occasionally on coercion. History is that of the drama of the battle for the truth of order, and of the impossibility of achieving final victory. This order will indeed be achieved in the soul of the philosopher. However, Plato does not know of any transcendental or divine polis, within which this tension might also be resolved at the social level. There is “only one historical reality”, as Voegelin writes, in which good and evil compete against each other, in a continually unresolved tension between the actual political order and the spiritual substance. The model of the Republic is not intended to be embodied in a historical polis. The eschatological dimension of the order thus leads to the dissociation of the destiny of the individual soul from that of society. The anthropological principle reaches here its limit. If the drama of the soul is destined to find its resolution in death, the drama of the polis is destined to be resolved only partially and ephemerally, at those moments within the cycle when the soul of the philosopher succeeds in imposing itself as a model of social order. The philosopher, however, cannot give up fighting for the incarnation of the good in society, which would signify a diminution of his human stature. From this results the perennity of the struggle between good and evil in this world, which Plato represents using the model of cycles alternating between periods of exhaustion and recovery. It is only by means of this repetition that the historical world is able to represent an eikon of eternity in time, while demonstrating the distance between the model and its mimesis. Augustine, in this sense, resolves the Platonic aporia by separating the two polis, the secular city on this earth and the city of God in the beyond. Eschatology is thereby extended into the political domain. Secular history is not however oriented towards any kind of immanent fulfilment. It would be pointless to attempt to search for the signs of the moral progress of humanity in this history. Eusebius of Caesarea viewed the fact that Christ was born during the reign of Augustus as the sign of the fulfilment of time. Augustine, as Voegelin first remarked in The Political Religions in 1938, for his part saw the contemporaneity of the imperial expansion of the church and of the sack of Rome. Secular history is not oriented towards any kind of immanent fulfilment. The city of God is in this sense Augustine’s reply to the hybris of the new imperialism. No imperial policy is able to achieve the kingdom of God. Sacred history unfolds on another level to secular history: in every period of history, the city of God is filled invisibly with its citizens: to the latter, history reveals its true meaning, that of a trial for the purposes of preparation and edification. The present era is the sixth age of history, the seventh and final being the “blessed, transcendent end realm” situated outside of time. History is straining towards an unresolved end. Coming after the age of the Patriarchs, we might say that this age is, from a purely historical point of view, an age of decline. For the citizen of the city of God, however, it is the age situated between the first coming of Christ and his parousia. Between these two events, nothing (at least nothing substantial) happens properly speaking at the immanent mundane level. The only thing that happens, at a transcendental level, is the invisible and continuous peopling of the city of God. It would be wrong to speak of an Augustinian individualism or apoliticism, even if contemporary Augustinism has sometimes experienced the temptation of apoliticism. 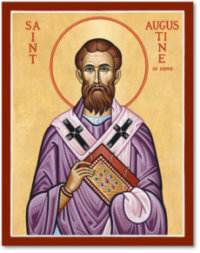 Indeed, for Augustine the Christian is bound to incarnate the order of the soul within the city. He is not, however, destined to embody it in history. This is why Augustine does not have to conceive of history as a cycle, as Plato did. The historical order finds its fulfilment beyond history. The Platonic scission between the good order of the soul and the order of the historical polis has in a sense been resolved, but to the benefit of another division, between the mundane history and the transcendental destiny of mankind.It would be easy to say that the Augustinian schema of history resolves the aporia of the Platonic schema. That would not, however, be completely accurate. Rather, the two schemata constitute two poles between which a meaningful history may be constructed. They are both in agreement to the extent that history is born out of the conscious tension, expressed in articulated symbols, of the soul towards a reality that it cannot attain in this world. The Platonic and Augustinian schemata represent points of equilibrium in the articulation of symbols, symbols that express the luminosity of a truth without dispelling its mystery. The mystery would be broken in the subsequent history of philosophy. We know that Voegelin interprets these breaks within the general category of “Gnosticism.” However, it should be clarified that Voegelinian Gnosticism has several faces. I shall cite here two of them. In the first place, an apocalyptic face, in which the eschaton is rendered mundane so that it may be accomplished in an historical and political future. History no longer expresses the tension towards the beyond, but becomes the embodying of an end that is immanent within the world and society. For Voegelin, Plato comes dangerously close to this rupture with his myth of the age of Cronos and Zeus, by heralding a third age, that of the Nous, in which mankind takes his own destiny in hand. The third reign of Plato is not, however, the third reign of Joachim of Fiore, for Plato is continually aware of the ephemeral character of the political order. Thus the myth of Cronos and Zeus assumes a cyclical form, conveying the perpetuity of the openness of the consciousness to reality. Another version of Gnosticism – which, for Voegelin, is most properly deserving of the name “gnostic” – consists of simply abandoning the field of history. The polis is not the location of the fulfillment of the Kingdom. The latter cannot be reached except by the individual soul in a position of apoliticism. It is, we might say, the Bultmannian version of Gnosticism, characterized by flight from the world and history, in favour of a refuge in the eschatological. By separating the destinies of the two cities, we might say that Augustine comes dangerously close to breaking this tension between pragmatic history and the eschaton. He nevertheless avoids this scission because, fundamentally, the city of God remains a city. The medieval notion of the corpus mysticum Christi extending to the imperium sacrum represents another path, indeed non-Gnostic in nature, opened by Augustinism. The Augustinian project to that extent remains, in opposition to that of certain contemporary Augustinian theologians, a political project. Platonism and Augustianism do not thus merely represent two models of a historical thought offering an alternative to the Enlightenment model, from which neither Toynbee and Löwith nor Jaspers were able to extricate themselves completely. They also attest that history is always situated at a balancing point, between the full articulation of symbols and their Gnostic distortion, between the luminosity of experience and the deceptive clarity of the conceptual. See The History of the Race Idea: From Ray to Carus, 1933, CW, 3, p.23, and “The Growth of the Race Idea”, 1940, CW, 10, p.51. See “What is History”, 1963, CW, 28, p.38 and “Configurations of History”, 1968, CW, 12, p.96 sq. See especially, The World of the Polis, CW, 15, pp.86-89; The Ecumenic Age, CW, 17, p.49. The World of the Polis, p.89. See especially, Israel and Revelation, pp.287-288 ; The World of the Polis, CW, 15, p.86; “What is History”, CW, 28, p.41 sq. ; “Equivalences of Experience and Symbolization in History”, 1970, CW, 12, p.116. Toynbee came close to this existential level of understanding in his third “batch” of A Study of History, but he ultimately failed to understand history on the spiritual level for want of hearing “the world [of God] as spoken to him personally” (“Toynbee’s History as a Search for Truth”, 1961, CW, 11, p.112). See “Configurations of History”, 1968, CW, 12, p.97; The Ecumenic Age, CW, 17, p.286. See my Preface to the French translation of Voegelin’s Plato and Aristotle: Eric Voegelin, Ordre et Histoire III : Platon et Aristote (Order and History, III : Plato and Aristotle, French trans. Th. Gontier, Paris, Éditions du Cerf, 2015, p.13-57. See Israel and Revelation, CW, 14, p.93; The New Science of Politics, CW, 5, p. 140 sq. Plato and Aristotle, CW, 16, p.418. Plato and Aristotle, CW, 16, p.97. See for example, World of the Polis, CW, 15, p.68. “Configurations of History”, 1968, CW, 12, p.113. The most important of these being the books Anamnesis (1966) and The Ecumenic Age (1974), to which we may add a series of articles, including “Toynbee’s History as a Search for Truth” (1961), “What is History” (1963), “Configurations of History” (1968), “Equivalences of Experiences and Symbolization in History” (1970). Enneads, V, 1 , “On the three Primary Hypostases”, chs. 9-10. See The Ecumenic Age, CW, 17, p.69. Plato and Aristotle, CW, 16, p.91. See the introduction to this volume by Dante Germino, who emphasizes this point. World of the Polis, CW, 15, p.72. Israel and Revelation, CW, 14, p.168. The Ecumenic Age, CW, 17, p.129 sq. Plato and Aristotle, CW, 16, p.151. See also the interpretations of the first words of the Gorgias, in Ibid., p.78-79. See in particular, Anamnesis, CW, 6, p.101 et The Ecumenic Age, CW, 17, p.51 sq. The Ecumenic Age, CW, 17, p.139 sq. See “Configurations of History”, CW, 12, p.104 sq. and The Ecumenic Age, CW, 17, pp.239 and 273. Israel and Revelation, CW, 14, p.186. Plato and Aristotle, CW, 16, p.211. “What is History?”, 1963, CW, 28, p.35. Voegelin provides a summary of the theses of Erik Peterson in his New Science of Politics, CW, 5, pp.170-174. The Ecumenic Age, CW, 17, p.273. Voegelin provides a summary of the theses of Erik Peterson in his New Science of Politics, CW, 5, p.170-174. World of the Polis, CW, 15, p.81. Voegelin is using Löwith’s analysis here, p.212. The Political Religions, CW, 5, p.50. See “Configurations of History”, CW, 12, pp.106-107. The Ecumenic Age, CW, 17, p.290. The Ecumenic Age, CW, 17, p.288. See “History and Gnosis”, 1965, CW, 11, p.157 sq. Thierry Gontier is a Board Member of VoegelinView and Professor of Moral and Political Philosophy at the Université de Lyon Jean Moulin–Lyon III in France. He is author of several books, with the latest being "Voegelin: symboles du politique" (Michalon, 2008) and "Pietro Pomponazzi entre traditions et innovations" (B.R. Grüner, 2009). Pride Goeth Before a Fall: Humility too?